This month's meeting was at Carla's home. Carla provided wonderful appetizers, a excellent dip with vegetables, mushrooms stuffed with crab and cheese and a very nice cheese with nuts and apple melted! We were only seven this month, Betty, Carla, Colette, Janet, Jolene, Michèle and Shirley. The book this month was Stanley Park by Timothy Taylor recommend by Janet. Timothy Taylor is a Canadian author from Vancouver. This is his first book. 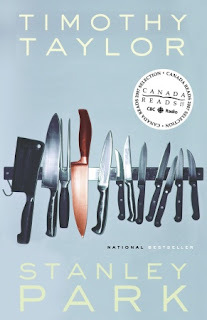 It was a finalist for CBC's Canada Reads competition in 2004 and was also short listed for the Scotia-Giller Prize. Most felt that the characters were well developed but many felt that the book was disjointed, difficult to follow and "weird". Many felt the book took a long time to take off. However some members very much enjoyed the book. All thought that it was definitely a foodie book. Those of us who have been to Vancouver and know Stanley Park and the neighbourhood around the Park enjoyed reading the description and recognizing the areas we had visited. The book also gave a good insight into a homeless community, in particular the community in Stanley Park and all the problems and challenges of homelessness not only in Vancouver but in general. There was quite an animated discussion on Jeremy's attitude after the restaurant re-opened towards his new clientèle and what he served them. Many members agreed that he was making fun of them, serving them squirrel and other things without necessarily telling them. Was Jeremy taking his revenge?